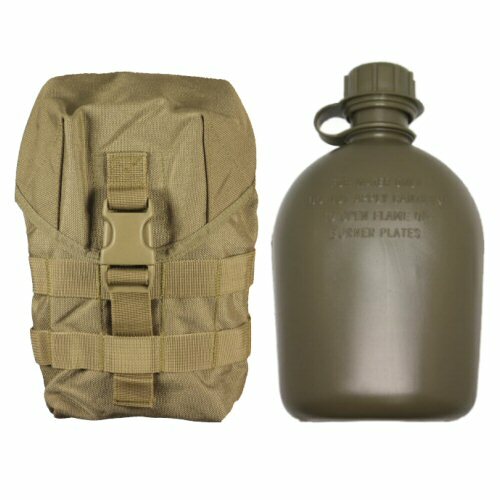 Genuine US military issue quart bottle (approximately 1.136 litre) and Tan MOLLE water bottle pouch set to provide a tough and durable hydration package for survival, outdoor, bushcraft, walking and expedition. The water bottle is self-sealing and made in strong military grade plastic. This is genuine US military issue, new and unissued. The pouch closes around the bottle on three sides to reduce the amount of dirt and damp that can get inside, but also has a drainage hole rivetted at the bottom. Pouch closes with single adjustable quick release buckle and is double secured with velcro if required. The front of the pouch has MOLLE loops for the addition of extra gear or carabiners, or for the addition of a shoulder strap. 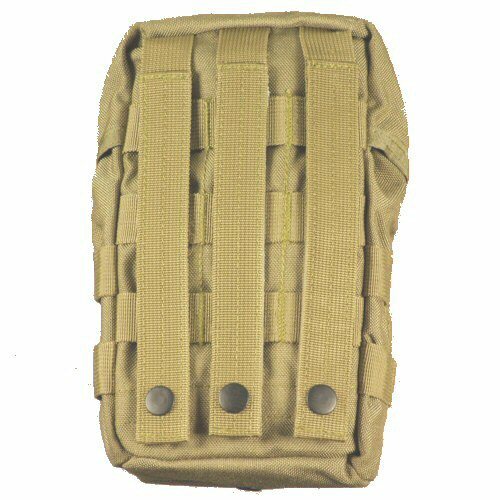 Pouch fastens via three MOLLE straps on rear, and can be mounted on a belt easily. The pouch measures 12cm at base, 21cm high and 5cm deep at the bottom, and 7cm deep at the body opening. Pouch is made from 1000D waterproof coated Cordura. The rear of the pouch has three straps to mount onto either belt or MOLLE base.